Push Your Luck Podcast: Castaways : Will we get off this island? Semi-cooperative you say? Yes semi-cooperative. 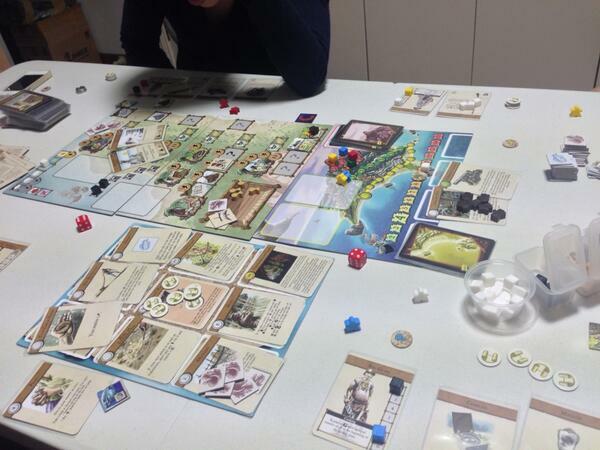 After the disaster of Archipelago, I am kinda turned off by semi-cooperative games. However after a few plays, I am happy to report that most of the time we played it cooperatively. That is because trying to get off the island is hard enough as it is without the players getting at each other's throat! You could play it as if you were a participant in Survivor the tv show but usually that will incur teasing from the other players. Only if all players manage to get off the island then we will see which of the players win (by counting the story chits they have collected throughout the game) and as mentioned, it is already quite tough to get off the island so players usually end up just being cooperative and doing what's best for the group. Compared to Archipelago, the willingness to work together to win the game is much better and so far I have not run into the problem of "since I am not going to win, I may as well cause everyone else to lose" syndrome. Players will need to plan to survive on a daily basis. That means they need to at least forage for enough food for everyone and, to a lesser extent, build better shelters and keep the fire going. At the end of every round, players need to have at least 1 food to gain back 1 energy. Having a fire going will provide 1 more energy as well. Energy is very important in the game because it will determine what actions you can perform. It also indicates the player's life because when you are down to 0 energy and need to lose more, you will incur an injury. At the end of every round, you will roll a dice to see if the injury worsens and you suffer for it. Take note that players may die in the game which can create for amusing situations. Better shelters will allow recovery of more energy when players take the "Rest" action. Exploring the island is an essential part of the game because the game can ONLY end if 1 player has reached the top of a mountain in the middle of the island and thus allow the players to effect a rescue. There are 3 portions of the island, the coastal areas, the forests and the inner part of the island. As players choose to explore during the action selection, they will draw a card and follow the instructions. The cards bring much of the fluff to the game and its quite fun to read them out to everyone. Cards usually provide players to move their token closer to the top of the mountain, a story token or move their tokens further from camp. Moving the token closer means that players are closer to ending the game as well as unlocking the other portions of the island. Story token means points at the end of the game. Further from camp means how likely it is for players to make it back to camp once they have decided to stop exploring. Yes, players can get lost while exploring. If they do, they have to spend the next round(s) making their way back to camp (which means they cannot participate in constructive actions at camp). This is also where the choose your adventure part comes in. Often the cards will tell you to make a choice and then take out a particular card to add to one of the 3 sections. This means that later on when exploring that particular section, you will probably encounter the follow up story again. This is one of the highlights of the game because its quite thematic and allows the players to create their story for the game they are playing. Take note that upon reaching the top of the mountain, it doesn't mean you will escape 100%. You will have to choose a card from the remaining events deck and look at the icons at the bottom of the card. Only if the party has the equipment that matches all the icons of a remaining card, then the party has successfully escaped! So far my groups that have been playing have been close but no cigar though which is kinda sad. So what's fun about it ? I liked how thematic it can get but it does require the right group to play it. The fluff in the card definitely needs to be read out loud and everyone get into their roles so as to make it an enjoyable experience. The choose your adventure portion of the game is also quite fun for me and I find myself hoping to encounter more of the special events so as to explore the 100+ cards available for players. Art and components are quite good and everything is clear and nice to look at. The main problem I have with the game is that While the fluff is nice and there are 100+ cards that can ensure at least a few plays that won't be repeated, I am not sure the long term replayability of the game. I suspect that after 5 plays you will probably be going through most of the same cards especially for the Coastal deck. The other problem will be the initial few steps that the players take will almost always be the same because the interesting events have not yet occurred until the players start exploring. Finally, like most cooperative games, it suffers from the solo leader problem. In this case, since it supports 1 player, a dictator can pretty much run the whole show. I am interested in reading your review of Robinson Crusoe. I ordered Castaways then cancelled it. Now I'm looking at RC and I'm close to ordering it, but haven't yet. Better to take my time before paying sixty-some dollars for it.